Just got back from a vacation (didn't take the C-Max, as my '18 Equinox gets the same highway MPG!!). I saw a large motorhome flat towing a C-Max. Nice car to put behind a motorhome, although I'd prefer something under 3,000 lbs back there, personally. Our C-Max is 3,600 lbs, a little heavy, not awful I guess. But I digress. 1. Is flat towing allowed? Yes, Owner's Manual says its fine, and gives a procedure. 2. What happens in the transmission and even the engine crankshaft? ....hmmmm, clues, yet I'm not sure what is turning among the ring gear (motor), planet carrier (engine), and sun gear (motor)?. There aren't any clutches to stop anything from turning, right??? Some hybrid systems will disconnect (declutch stuff, I know, but not ours AFAIK. 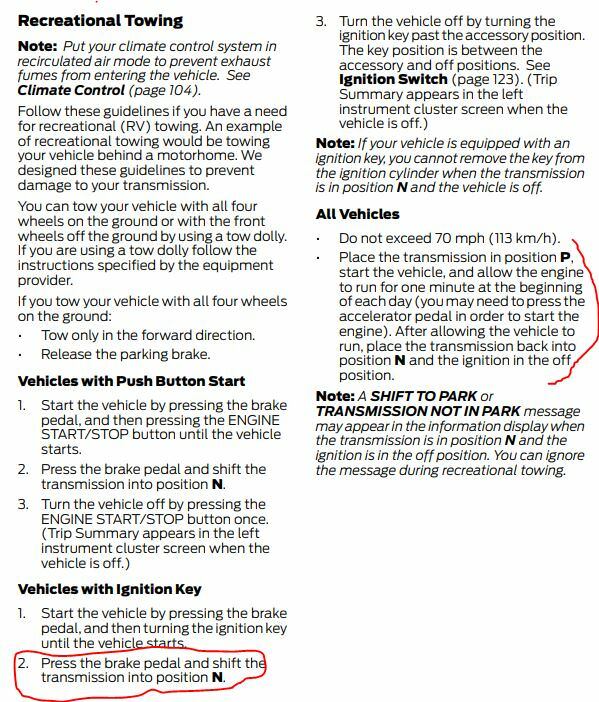 Note the part that says, after you turn the car completely ON, then hold the brake down and shift into N. What does that do? 1. As the front wheels turn, the ring gear and a motor turns. 2. That turns the planet gears, and may cause the engine to turn over a little since the the sun gear's motor may not be locked down(???). So I'm not sure if the planet carrier moves (engine turns over slowly). When being driven, I know the sun gear must whir around in the opposite direction of the ring gear (ring gear tied to the road) when the engine is still (off). 3. Transmission fluid pump only runs when the engine is running, which is why the ENERGi version has an auxiliary oil pump since it has to run 20 miles in EV mode. MIne is a non-ENERGi hybrid. So, are all the gears & bearings getting fluid? Maybe I'm remembering wrong, but I thought you had to have your foot on the brake to shift out of park. They started adding that to cars to prevent the "acceleration" issues some cars were having -- most of which were caused by people accidentally putting their foot on the gas rather than the brake when putting the car in gear after starting it. ...I thought you had to have your foot on the brake to shift out of park. You're right. It does look like holding the brake down while shifting to N means nothing relevant here to understanding the internal mechanics of flat towing. I just read some RV forum where somebody flat towed behind a motor home, followed all the Owner's Manual instructions correctly, and then had a transmission failure, which Ford at first said they would not cover because of "Improper flat towing.". The C-Max owner got the state attorney general to force Ford to grant warranty coverage since the Owner's Manual says you CAN flat tow. .... Its crappy how car makers, & not just Ford, have to be dragged kicking as screaming to cover warranty repairs sometimes!!! She paid nearly $6.000 to for dealership repairs on it. I think it may have exacerbated the early 2013 weakness (recall) of the some transmission bearings. Also, some others have reported a depleted 12v battery after flat towing. You would think the 12v battery would be recharged. Maybe just the early models did this??? I'm wondering if the ring gear motor acts gets into regen braking mode when flat towing???? And/or, does the sun gear motor go into generator mode when in Neutral like this? Edited by MaxHeadroom, 08 September 2018 - 03:33 PM. OK, further understanding (maybe!? ): With the ignition completely Off, no regen action happens, and it appears the engine & sun gear motor free-wheel. All I can really analyze here, is that the forces on the planet gear teeth balance in non-accelerating kinematic motion, meaning the force from the ring gear on the planet teeth must equal the sum of the forces on the sun side of the planet, and the crankshaft's planet carrier force. Big question is does this allow motion of planet carrier or sun gear? One clue from the Owner's Manual: Notice they say to start the car once a day. I guess this means some fluid gets lubricated. But this ignores the high number of miles a motorhome can travel in a day. You'd think the transmission fluid can wet the teeth OK during flat towing, even without the pump running. ICE will not turn when in N (way too much torque required to spin engine relative to torque required to spin generator when in N). When in N and vehicle in motion, the traction motor spins, the ring gear spins, the planet gears spin but the planet carry does not spin (ICE does not turn), the planet gears thus spins the sun gear and the generator spins in the opposite direction of the traction motor. With respect to the transmission gearing, N is no different than being in EV mode. Edited by Plus 3 Golfer, 08 September 2018 - 06:54 PM. I guess everything gets oiled (Mercon LV) in there, right? Wonder what Ford is trying to do with their "run the engine once a day" thing. I'd run a front wheels dolly, not flat towing. Anyway, I noticed at least one model year of the Prius (same ring/planet/sun engine/motor layout) does NOT allow flat towing. Toyota doesn't like it. Edited by MaxHeadroom, 08 September 2018 - 08:12 PM.